This is just sort of a "catch-all" category for all the things that can't make up their own page of PS8j. I think it sets up the mood fairly well, so I've placed it first. I suppose I could have looked cheerier, but it was barely six in the morning when this was taken. 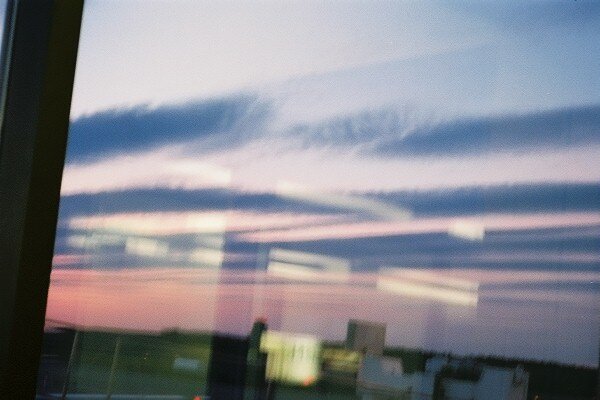 I was slipping out of town on the first Tango (a popular no-frills brand operated by Air Canada) flight that day, and my mental state was in a bit of a drag because I got maybe an hour of sleep that morning. 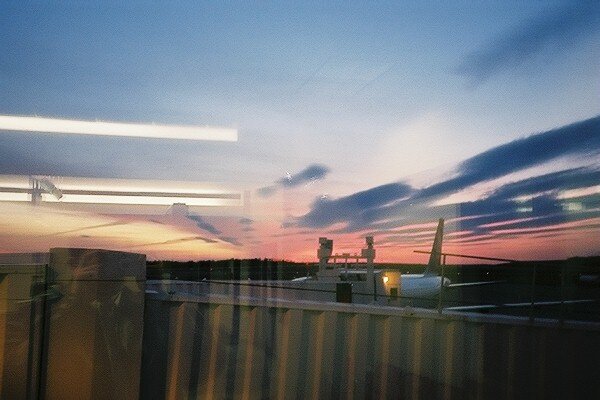 When I was up past security and into the departures area, I captured this beautiful morning sky on film. Aunt Jesse picked me up at the airport in Toronto, and I stayed in with her and Uncle Bill in Kitchener for a few days. 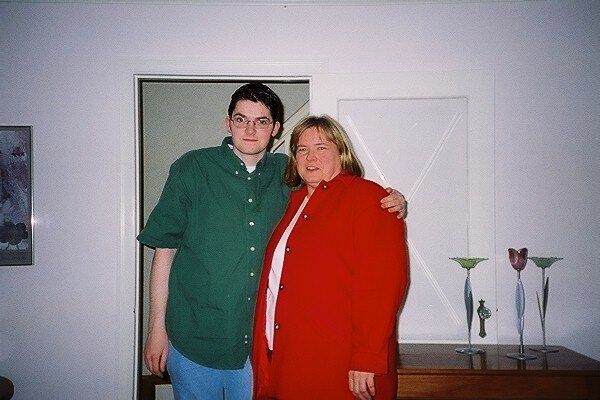 From left to right: Jesse Johnston (aunt), Rev. William "Bill" Johnston (uncle), Andrew Johnston (first cousin), Alexander Johnston (first cousin). 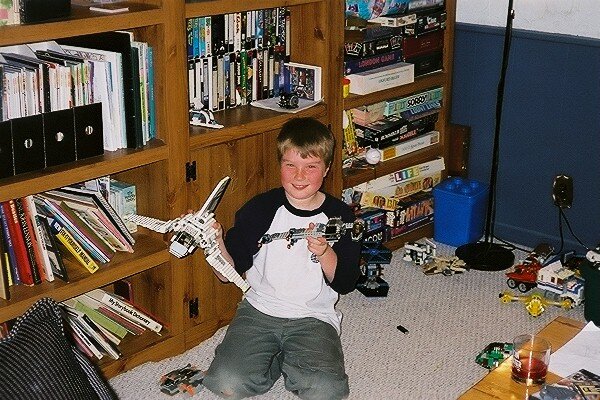 Here's a shot of Alex playing with some of his Star Wars Lego models. 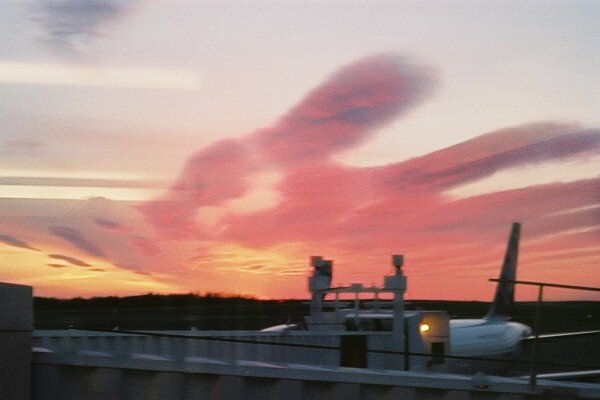 That's an Imperial shuttle in his right hand and a B-Wing in his left. A modified airspeeder ("snowspeeder") sits at his right knee. It should be noted that he usually wears pants without holes in the knees. Until you've eaten here, you haven't lived. Uncle Bill and Aunt Jesse took us all there, and I was kind of skeptical at first. "Stir fry?" I wondered aloud. "How can that be a culinary experience?" Well, it can be if you fry up just about anything that suits your tastes - for me, "stir fry" and "vegetarian" went hand-in-hand - including various pastas, vegetables, meats, spices, oils, and sauces. Here's what you do: You wait to be seated, then order up one or unlimited trips to the grill (two should be enough for most people). You go down, grab a bowl, toss in whatever suits your fancy (plus some required items like oil and sauce - there are signs to tell you how much is required and other signs to suggest recipies and combonations), then take it over to the grill. This is where the magic begins. I don't know how these Gods of the grill can do it. At any given time, they have something like fifteen or so people all standing around, all with different piles of goop waiting to go or being grilled - how can they keep track of all of this? I was amazed to watch. Also, these people are trained to GRILL. They do not care about things like proper lighting levels, falling over from the heat, or keeping dirty bowls in neat stacks. It is an education to watch a grillman take your bowl, empty it onto the grill, and toss the bowl into a bin underneath the outside circling counter - this all happens in less than two seconds and the bowl frequently gets the worst of it. You'll probably see maybe five bowls smash into bits just while you're waiting for your food. 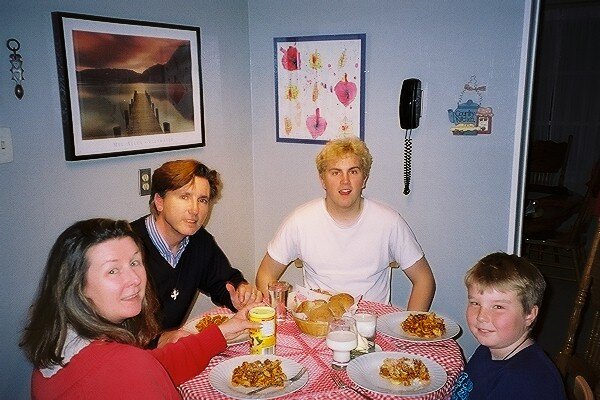 Then a few mintues later you get a fresh bowl with your freshly-cooked, unique, "no-two-alike" meal selection. It is wonderful to behold. All in all, it's a great restaraunt (check for franchised outlets elsewhere in the tri-cities area), although I'm not sure if I'd want to go there on a first date. You spend half your time making trips back and forth to the grill, and it is a restauraunt that thrives on noise and bustle rather than peace and quiet. Then again, there is a regular menu with "Mongolian" favorites, but you don't see people ordering from it much. Digression: Final Fantasy VIII - I cannot! I spent entirely too much time playing FFVIII while in Kitchener. I started with my crappy save with most of Ultimecia's guardians toasted, but with Squall only on level 45 or so, with everyone else faring worse to much worse, and me missing most of the GFs and never having played a game of cards except one game with the guy who gives you a starter deck in Balamb Garden. With some time though, I built up my party into a force to be reckoned with. Two days later, Squall was on level 92, Quistis and Rinoa in the high 80's (The other three characters aren't even worth thinking about, with Selphie at 32 and Irvine and that punchy-punchy guy in their teens.) I got lots of GFs - all except Carbuncle and Tonberry King, and I got all kinds of AP and EXP. I guess I was hooked on FFVIII even though I didn't really like it. FFVIII (like FFV) has always given a great deal of hassle because I don't like the ideas of magic being permanently consumable, or even worse, junctioned (because then when you cast, your stats go down), nor do I like having so many restrictions and rules. FFVII I could work my head around, but this - well, I think that if a game is complex enough that a guide book is almost a necessity (boooooo! ), then I also think the designers ought to take another look at their set-up and perhaps make things more intuititve. I like Final Fantasy quite a bit, though there are individual games in other series that I like much more. As far as FF goes, I own IV through IX, but I've only beaten VI and VII, so I have a lot of catching up to do. I'd crank out the GameShark, but I have certain principles to uphold. When I got to Ruth-Ann's in South Leaside, Toronto, I first walked to Younge Street and back (several miles all told), then when I returned, my first cousin once removed Marion (Ruth-Ann's sister) took me to dinner at a nice spot on Bayview Avenue. Marion, being a self-proclaimed "workaholic," hasn't been down to PEI for something like a zillion years =) (but that's kind of understandable, it's not like there's anything to DO there! ), so we hadn't met before! Isn't that neat? 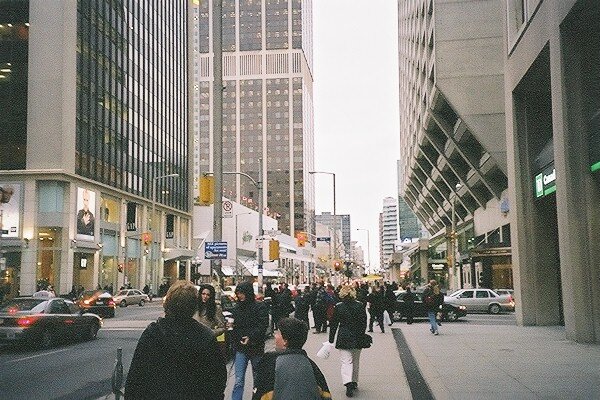 Toronto. Big place, no personality. 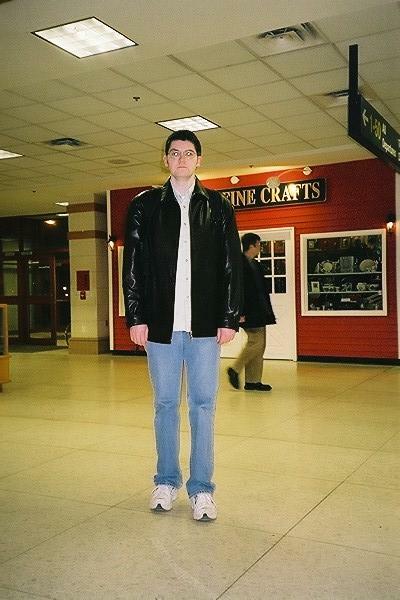 I was kind of glad to get back to Halifax. 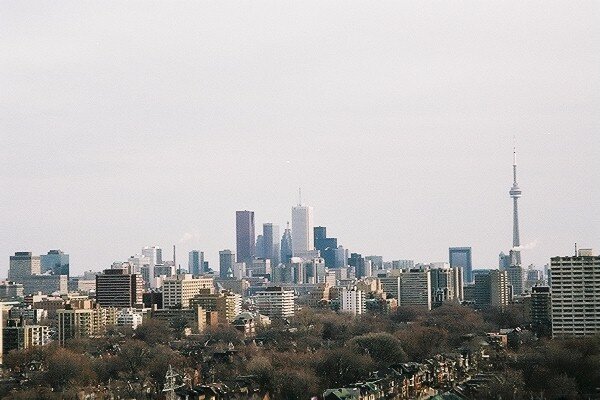 Here's a Toronto skyline shot I took from the tower of Casa Loma. This is just the introduction of PS8j, there are many more photos and descriptions on the following pages. This area just serves as an appetizer.